There are three main reasons why necklace clasps sticks and one main reason they do not stay shut. 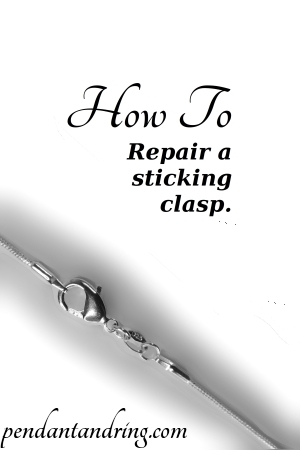 Here are some quick and easy tips to help you repair your clasp and get on with your day. If your clasp has fluff and stuff blocking the action of the internal hinge you can fix it by removing the foreign matter. If sweater fluff is the culprit, you can use a safety pin to gently and carefully remove the fluff. Insert the safety-pin into the back of the clasp, where it attaches to the chain, and push and fluff through the clasp and out the other side. It typically takes three sweeps with the safety-pin to restore the clasp’s proper movement, but it may take more! To prevent this from happening again put on your necklace then wrap the clasp with a small piece of clear tape. The tape serves as a barrier, protecting the clasp from anything that it might catch on. If a strand or two of hair has hopelessly tangled itself around the internal mechanisms of the clasp you can dissolve the hair with bleach. Remove what hair you can before bleaching. Use a small container, something like a medicine cup, or soda lid to help free the clasp. Fill your small container with bleach. Set the clasp in the bleach and set a timer for 10 minutes. When time is up get a pair of plastic gloves, check and see if the clasp is hair free. If it is not, return the clasp to the bleach for another 5 minutes. If the hair dissolved, try moving the clasp. Nine times out of 10 this will repair the clasp. To prevent hair-tangle from happening again, put on your necklace then wrap the clasp with a small piece of clear tape. If the clasp is still stuck check tips 3 and 4 for possible solutions. If your clasp looks fine but will not open or close, a pen-knife is a magical tool. Really any small blade will do the trick. Take the clasp in your non-dominate hand. Use the knife with your dominate hand. Insert the tip of the knife into the side of the clasp and gently twist the knife to increase the distance between the top and bottom of the clasp. Open and close the clasp after each twist to check if it is working properly. Go slowly and gently with this repair. Too much twisting will result in a clasp that opens on its own. If that happens refer to tip #4. If the clasp will not stay shut, you can use a clamp, or small hammer to gently compress the clasp to reduce the distance between the top and bottom of the clasp. Go slowly and gently with this repair. 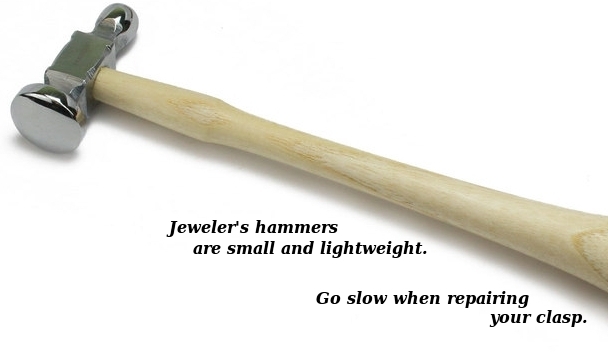 Too much hammering, or vigorous hammering could break the clasp, or result in a stuck clasp. If your free moving clasp is now stuck refer to tip #3, and be easy, jewelry work requires a delicate touch. Hope your clasps are functioning properly now! Remember to subscribe below – for more jewelry tips and tricks from Pendant and Ring. Pin it and follow us on Pinterest!